Few days in Microsoft's history have been as fraught with expectation as Nov. 30, 2006. That was when company CEO Steve Ballmer announced at a New York City press conference that Windows Vista had finally reached market. "This is the biggest launch in our company's history," Ballmer said. Released first to business customers, the newest version of Microsoft's flagship desktop operating system became available to consumers at the end of January. Mass.-based analyst firm IDC forecast "rapid and widespread adoption" of Vista, the company's first new operating system in more than five years. More than 90 million computers worldwide would be running Vista within its first year of shipment, the study predicted, including over 35 million in the United States. What's more, Microsoft's channel could expect to collect roughly $70 billion on Vista-related products and services in 2007 alone, IDC stated. Ask Brent Morris how Vista has actually been selling, however, and his response is decidedly more subdued. Morris is director of sales and marketing at Success Computer Consulting Inc., a Gold Certified integrator with headquarters in Minneapolis, Minn., and a client list of 350 companies. "It's somewhat limited," he says of demand for Vista. "We don't have too many [customers] coming to us saying, 'we want to upgrade.'" Nor has Vista juiced his firm's revenues significantly yet, he adds: "It's having some kind of impact, but I can't tell you to what extent." With all the pre- and post-launch hoopla from Microsoft and others, surely Morris had higher hopes for Vista, right? Brent Morris (top right), Director of Sales and Marketing, Success Computer Consulting Inc.
Neil Rosenberg (bottom left), President and CEO, Quality Technology Solutions Inc. Guess again. "Our expectations were right on track," he says. Businesses typically take a "wait-and-see" approach to new operating systems, so rapid early adoption of Vista would have been surprising, Morris argues. Moreover, nothing he's seen yet has dampened his enthusiasm for Vista. "We're very, very excited," Morris says. "[Vista] will make us more profitable." And so it goes for many in Microsoft's channel these days. Some eight months after Vista's launch, most partners report slow, even disappointing, initial demand for the much-heralded new OS -- yet few of them seem terribly concerned about it. Not surprisingly, Microsoft has remained largely upbeat about Vista's adoption rate. Ballmer initially sought to dampen expectations for the new operating system, warning in a February speech to financial analysts that some revenue forecasts for Vista were "overly aggressive." But three months later, during a May 15 keynote at the Windows Hardware Engineering Conference in Los Angeles, Microsoft Chairman Bill Gates announced: "As of last week, we've had nearly 40 million copies sold, and so that's twice as fast as the adoption of Windows XP." Such figures make Vista "the fastest-selling operating system in history," added a Microsoft press release distributed the same day. 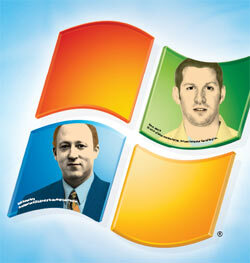 Partners are experiencing robust demand too, says Microsoft's Mike Burk, a product manager on the Windows Vista team. "They're seeing the same thing we are: There's strong demand for the product both in the consumer segment as well as the business segment," Burk says. Microsoft grants Windows XP "downgrade rights" to customers that acquired Windows Vista through a volume-licensing agreement, are enrolled in the Software Assurance maintenance program or purchased a PC running the Business or Ultimate version of Vista from an OEM or system builder. So far, according to many partners, most eligible customers are exercising those rights -- but Microsoft is making the process harder than it needs to be. The company says that customers or partners must downgrade licenses one at a time. Obviously, that requirement can create a time-consuming nightmare for organizations that are deploying new PCs by the hundreds. Meanwhile, notes Jordan Malkin, operations manager at system builder MicroStandard Distributors, the poorly trained call center staff supporting the downgrade process often has trouble answering his questions. Not surprisingly, partners are complaining loudly. And according to Mike Burk, of the Windows Vista product team, Microsoft is listening. "We've heard the feedback, and we're looking at ways to make the process easier," he says. Microsoft recently detailed first steps toward a solution for managed partners. Malkin thinks he knows why things are moving slowly. "The subtext there is, 'We don't want you downgrading,'" he says. "Generally when they buy new computers they're just putting an XP image on there, even if it ships with Vista," says Neil Rosenberg, president and CEO of Quality Technology Solutions Inc., a Gold Certified network integrator based in Morris Plains, N.J. The same is true at Dimension Data Holdings plc, a global IT infrastructure integration firm and Gold Certified Partner with U.S. headquarters in New York City. Only 10 to 15 percent of Dimension Data's customers are imaging newly bought PCs with Vista, according to Phil Aldrich, the company's Microsoft practice manager for North America. "We kind of expected 15 to 20 percent in the first 12 months and then a gradual increase over a three year period, mostly because that's what we've seen over previous [Windows] releases," Aldrich says. According to Malkin, all of that downgrade activity may help explain the disparity between Microsoft's robust demand reports and the slower adoption rate that partners are observing. "A lot of the Vista sales you see in the channel now are not Vista implementations," he says. Malkin points to data from the semiconductor industry for further evidence of tepid Vista demand. Prior to the resource-hungry new operating system's launch, chip manufacturers stepped up production of dynamic random access memory (DRAM), anticipating a spike in shipments that never materialized. "Now there's a huge glut of memory," Malkin says. Indeed, late in May, Stamford, Conn.-based analyst firm Gartner Inc. dropped its forecast for worldwide semiconductor industry revenue growth in 2007 from 6.4 percent to 2.5 percent, due largely to "excess capacity and continued price declines" in the DRAM market. "That gives you an indication of what the channel has seen," Malkin says. Meanwhile, some partners say the bulk of their customers haven't even started planning their Vista migration, a process that Gartner predicts will take an average of 12 to 18 months to complete. For example, at IntelliCom Computer Consulting Inc., a Gold Certified IT consulting firm with offices in Kearney and Grand Island, Neb., only 15 to 20 percent of customers are actively preparing for future Vista deployment. "They haven't found a compelling reason to upgrade," explains John Elliott, the company's vice president of business development. Partners cite a variety of factors to explain Vista's sluggish debut, including the fear, uncertainty and doubt that surround any new operating system. "Any time a new release of anything is out there, there's hesitancy to just jump in with both feet and assume it's going to be flawless," notes Elliott. Paul Asseff, Microsoft marketing manager at Softchoice Corp., a large account reseller and Gold Certified Partner headquartered in Toronto, echoes that view. "There's just a good chunk of customers that want to wait 12 to 24 months before they move to a new operating system, regardless of how compelling the offers are," he says. Rosenberg expects some of that hesitation to dissipate when Microsoft issues the first service pack for Vista, though, at press time, the company hadn't yet officially confirmed that it even had one in the works. But even then, he predicts, many IT organizations will continue postponing the time-consuming Vista migration process. And, of course, most IT departments are already overstretched. "I don't have a single customer that's going to be able to [complete] all the projects they want to this year," Rosenberg says. Compared with a business application rollout or e-mail system upgrade, he adds, companies typically view refreshing their desktop PCs as a mid-tier priority. In many partners' eyes, however, Microsoft ultimately has only itself to blame for Vista's slow start. Aldrich, for example, faults Microsoft for providing inadequate large-scale deployment tools. He notes that System Center Configuration Manager 2007, the company's forthcoming replacement for Systems Management Server 2003, will make enterprise-grade Vista rollouts much simpler -- when it goes on sale in the fall. "Ease of deployability and management is a big deal in corporate environments, and right now [Vista] doesn't have that," says Aldrich. That may be one reason unusually large numbers of businesses are planning to implement Vista piecemeal as they retire their worn-out PCs. "This is the first new version of Windows that enterprises seem to be moving to through attrition as opposed to doing a forklift," says Michael Silver, a research vice president at Gartner. An even more common complaint among partners is that Microsoft failed to ensure widespread early availability of hardware drivers and compatible software products for Vista. That's a deal-breaker for many customers that are otherwise eager to deploy the new operating system, says Rosenberg, whose own finance team uses an accounting system that doesn't yet run under Vista. Microsoft's Burk acknowledges some "compatibility challenges" in the first weeks following Vista's launch. However, he continues, more than 1,600 applications had earned either the "Works with Windows Vista" logo or the more demanding "Certified for Windows Vista" logo as of June, up from 100 at launch. And that's in addition to more than 10,000 logo-bearing hardware devices, he says. All told, more than 1.9 million devices were compatible with Vista as of May, according to a Microsoft press release. Just the same, some partners feel Microsoft released Vista prematurely. "I don't think it really was ready for prime time," says Malkin. "If you don't come with complete infrastructure support [and] driver support, you're not going to have success no matter how good the product is." While Malkin is hardly alone in his frustration, most partners take Vista's slow beginning in stride. The new version of Windows may not be boosting revenues, they say, but it isn't hurting them either. "It would be nice for Microsoft if there was a bigger uptick, but it really hasn't affected [us]," observes Aldrich. "We're still doing a comparable amount of business with XP." Moreover, most partners expect demand for Vista to rise over the next year. "We see it accelerating," says Scott Johnson, executive vice president for partnerships and business development at Ensynch Inc., an IT consulting services firm and Gold Certified Partner headquartered in Tempe, Ariz. In fact, Johnson believes the pace of adoption is already heating up. "The demand now is what we expected a little earlier on," he says. Johnson credits much of the recent sales growth to the deployment preparation engagements that Ensynch has been conducting with its customers in recent months. Helping customers develop a Vista migration plan has a 90 percent success rate at inspiring faster rollouts, he says. The Microsoft Application Compatibility Toolkit, which helps businesses inventory the software products they use and evaluate whether they'll run properly under Vista. The Solution Accelerator for Business Desktop Deployment 2007, a set of instructional guides, templates and scripts designed to simplify deployment of both Windows Vista and Office 2007. The Windows Automated Installation Kit, which helps businesses plan and execute hands-free Vista installations. The Virtual Hard-Disk Test Drive Program for Windows Vista Enterprise Edition, a 30-day trial version of Windows Vista Enterprise Edition that customers can quickly deploy in a contained, virtualized environment. The Desktop Deployment Planning Services program, which provides customers of Microsoft's Software Assurance maintenance offer up to 15 days of free rollout preparation assistance from either a partner or a Microsoft consultant. For more information on such resources, visit the Microsoft Web site and the Microsoft partner portal. Targeting particularly receptive market segments can also help raise Vista adoption rates, many partners contend. For example, Asseff says, small and midsize businesses are deploying Vista in greater numbers than enterprise firms because those SMB companies tend to find a desktop refresh less daunting. Silver, the Gartner analyst, adds that companies still using Windows 2000 are also likely candidates for rapid Vista adoption, as are health care, financial services and government organizations. Subject to strict data privacy regulations, customers in those industries often see strong appeal in Vista's improved security features, he notes. Still, many partners are looking to the powerful Microsoft marketing machine for more help in driving up Vista adoption rates. "They did a good job pre-launch and they did a good job at launch, but they've probably been a little lax in their post-launch campaign effort," says Elliott, of IntelliCom Computer Consulting. "There needs to be a rejuvenation in the education process." Rosenberg wants more outreach from Microsoft as well, mostly in the form of confidence-building measures, such as testimonials from satisfied customers. "Demand generation isn't as important as creating the awareness that the product is mature and stable," he says. Malkin, though, fears it may be too late for such initiatives. "The opportunity to do that was six months ago," he says. Vista's market share is sure to expand in the years ahead, but the time for momentum-generating marketing campaigns has passed. "Now we're on the slow slog up the hill," Malkin says with a sigh. Like many of his peers, however, Rosenberg takes a more sanguine view of Vista's future. Deployments will start picking up soon, he says; partners just need to give it time. "What they have to do is remove the roadblocks and make people feel comfortable and safe," he argues. For partners who take that approach, he adds: "The rest will flow." A November 2006 press release from analyst firm IDC describing projected demand for Vista is located at http://www.idc.com/getdoc.jsp?containerId=prUS20452706. A May 2007 press release from Microsoft about market momentum for Vista can be found at http://tinyurl.com/yuckrw. A May 2007 press release from analyst firm Gartner Inc. on semiconductor sales trends is available at http://www.gartner.com/it/page.jsp?id=506581.